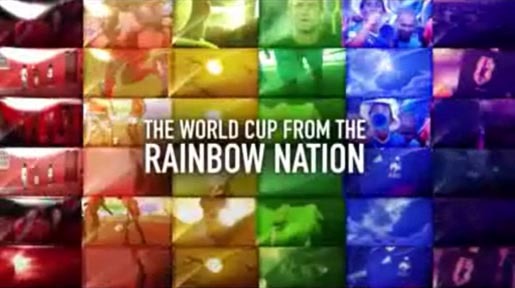 BBC broadcasts of the 2010 FIFA World Cup have been promoted in “The World Cup from the Rainbow Nation”, a promo video featuring a montage of African wildlife and cultural scenes mixed with shots of the teams and players competing in South Africa. The trailer features “Soviet Science”, a track by London band The Dallas Guild. See more of the BBC’s online coverage of the World Cup. BBC’s World Cup campaign was developed at RKCR Y&R by executive creative director Damon Collins, art director Paul Angus, copywriter Ted Heath, agency producer Ella Littlewood at Red Bee Media, working with BBC Sport Head of Marketing and Communications Louisa Fyans and marketing manager Karen Potterton. Filming was produced at Digital Kitchen by head of creative Mark Bashore, executive creative director Matt Mulder, creative director Johan Liedgren, executive producer Eric Oldrin, senior producer Chezik Walker, editor Brian Cole, directors of photography Trevor Fife and Morgan Henry, designers Sean Dekkers and Chris Abbas, colourists Ryan Gagnier and Cody Cobb.